In this tutorial I’m going to teach you how to make a homemade Reflux Still which is also known as a column still. This homemade still is comparable in quality to most professionally designed stills like this 8 Gallon stainless steel Reflux still but will cost you less to build. What are the benefits of a Reflux still over a Pot Still ? A Reflux still can produce high proof alcohol in a single run because it effectively re-distills the alcohol multiple times within the column before it is drawn off by the condenser. This is one of it’s biggest advantages over a pot still . If your looking to make a high proof flavorless moonshine then a Reflux / Column still is what you want to make. Choosing a good boiler for your Reflux still is important. The most important thing is that the boiler you choose is made of stainless steel. Some examples include restaurant pots, beer kegs or used milk cans. When choosing between these options you should think about how your going to attach the column to the boiler in some cases specialized welding and fabrication may be required to make the connection between the two units. Also the column should be easy to separate from the boiler for cleaning and storage and it should be large enough to distill batches of mash. Make sure you have considered all these things before you commit to choosing a specific boiler. I’ve choose to use this stainless steel milk can which I bought from Amazon for this project. It’s durable, easy to clean and comes with a 2 inch tri-clover connection in the top of the lid for your tower. Makes things easy no fabrication required. I’ve also used kegs before they work great as boilers but do require custom fabricate for clean out and column connections. The best thing about using a Keg is it’s a great excuse to buy/drink one. The top end consist of several components including the reflux column, the cooling tubes, and the condenser. We will build each one separately and then put all three components together. Let’s get started. We’re going to build a jacketed core condenser for this still. I love this style of condenser because it is simple, efficient and durable. Below is a diagram of the condenser assembly to give you an idea of what your going to build. With this condenser water circulates through the water jacket cooling the condenser core. This process strips the heat from the vapor entering the condenser unit and turns the alcohol vapor into liquid form. We won’t get into the process of designing the condenser for efficiency as that’s beyond the scope of this project and I’ve already done the hard work for you. To increase the amount of Reflux within the column of the still I’ve run the 1/2 ” supply and return lines to the condenser through the column. For the still to operate correctly the direction of water flow is important. The water should enter the bottom of the condenser and exit out the top. See illustration above for details. Step 5 – Assemble the condenser jacket as shown below, place condenser core inside jacket to make sure it fit’s properly. You may have to fine tune it so everything fits properly. Once your satisfied with how everything looks Solder all joints. When the Condenser is fully assembled it should look like the image to the right. The reflux column is the part of the Still that is responsible for producing high proof alcohol. It does this by producing multiple distillations within the column. To build the Reflux column we need to assemble a few things first. 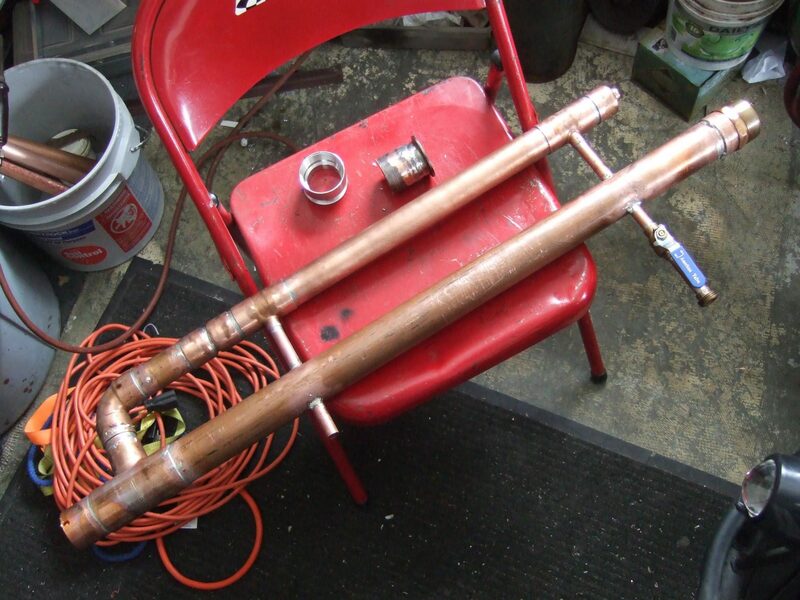 1 ½” tee, a 3″ long piece of 2″ copper pipe, a thermometer and a 2″ cap. See illustration below for further details. Step 1 – Drill a 3/8 ” hole in the top of the 2″ end cap. Fit the rubber grommet and thermometer into the hole to make sure they fit. 1 ½” tee and solder in place. 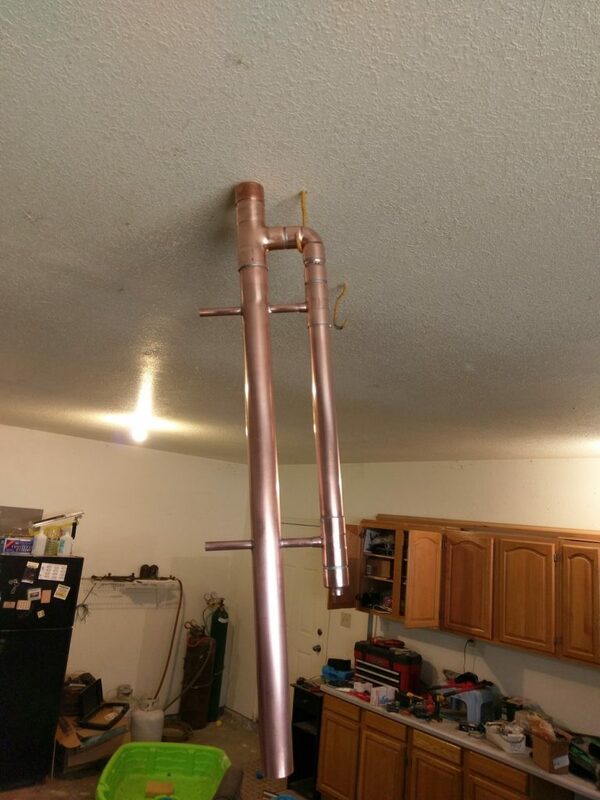 Place Cap on top of 3″ copper pipe. ( Do Not Solder This Piece – Cap will remain un soldered so that your able to open the top of the column for cleaning after use. The column body is made up of a three foot piece of 2″ copper pipe. The bottom of the column body attaches to the boiler and the top attaches to the column head that you just made. Step 2 – Measure from the bottom of the pipe up 1.5 ‘ place a mark. This will Mark the Center point of the pipe. Step 3 – Measure from the center point up 9 1/4 ” and down 9 1/4 ” place a mark at both locations. These two marks should match the lower and upper cooling tubes coming from the condenser. Step 4 – Using the marks from Step 3 drill two 5/8″ diameter holes directly through both sides of the copper pipe. Step 7 Attache the 1½” Elbow and the 1½” Copper Tubes which are 2 1/2″ long from the Tee Joint on the top of the column to the top of the condenser. Once you are sure everything fits together correctly solder all joints. The final step to building the still is attaching the column to the boiler. You may have to alter these instructions depending on the boiler you decided to use. Later I will try to post a how to guide for attaching a still to a keg and a cooking pot but for now we will stick to the milk can which is what I’m using. Step 2 – Slide 3″ of the copper column through the hole and Mig weld in place ( If you don’t have a Mig welder take it down to your local welding shop they will be able to do it for you for a reasonable price. Now that your done building the Reflux / Column Still you need to pack it. The Packing increases the surface area available for alcohol vapors to condense on and will greatly increase the amount of Reflux within the still thus giving you a higher quality final product. material for Reflux stills include stainless steel scrubbing pads, marbles, broken safety glass from an automobile, glass beads or raschig rings. The idea here is to use a packing material with a high surface area that won’t release impurities or poisons into the Moonshine. It also shouldn’t be affected by the high heat and moisture conditions within the still. I personally love using Raschig rings because they are easy to remove from the column of the still and they will not corrode. However they can be hard to find locally. You can buy them online here. My second choice for packing is stainless steel pads which work great and can be purchased at any hardware store however they can be a pain to remove from the column and can corrode over time. Step 1 – Make sure screen on bottom of tower is firmly attached to hold packing in. Step 2 – Add Packing to tower until column is filed to just above the top of the highest cooling tube in the column. Step 3 – place cap back on top of column. 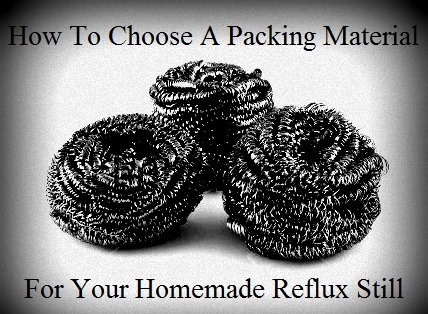 There are several different options when considering a heat source for your homemade reflux still. These include using a stove top, an external propane boiler or a internal electrical immersion heater. Let’s look at all three options so you can decide which to use. 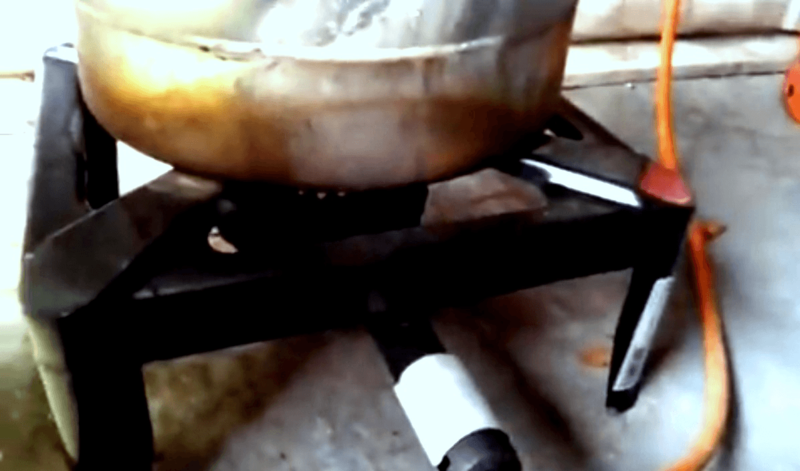 Stove Top Heat Source – If you don’t mind making moonshine in your home this is the easiest option. Although be warned if your making multiple batches don’t expect to use your stove for cooking for several days! Propane Boiler – I like the idea of using a propane boiler unit because it’s portable which means it can be used outside or in your workshop. It’s also easy to clean, no fabrication needed and very easy to fine tune the heat going to the still. Electrical Immersion Heaters – This is the most efficient option in terms of power consumption. However it is more difficult to clean and you can only use this type of heater for Sugar Washes. If you were to use an electrical immersion heater in a corn or grain mash you would burn the mash and have a terrible flavor in your moonshine. For this still I’ve chosen to go with the propane boiler. I’ve posted a photo below so you can see what it looks like. Before you start distilling you will need to hook your still up to a water source. I like to use a garden hose. Simply clamp the hose on the inlet of the condenser ( i.e the lower 1/2″ copper tube located on the condenser and hook another hose running to a drain on the upper tube coming from the condenser. You can adjust the flow of water to your still by the garden hose shut off valve. If you’ve never made your own alcohol before or you’re hungry to learn more about making moonshine. 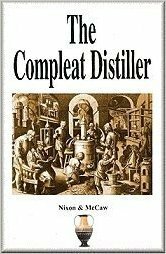 I’ve put together this list of 5 how to moonshine books I think every one should read. If you read even one of these books you’ll be well on your way to understanding the theory and concepts that will allow you to safety operate the reflux still and make a great tasting spirit at the same time. Now keep in mind most of the information you’re probably seeking is available for free online if your willing to spend the time looking for it. If you would like more information on distilling for “FREE” then check out our Distilling 101 section for tips and tricks to making the best Homemade Moonshine! This concludes my tutorial on how to build a reflux still. I’d love to hear some feed back from you. If you have any questions leave a comment below. If you’ve built your own reflux still post some pictures of your still you’ve made. If you’ve decided to take on the challenge of building you’re own copper still why not show it off! Send us a photo ( learntomoonshine (at) gmail (dot) com ) of you’re complete still and we’ll add it below. If you’ve made alterations from the plan outlined above please tell us what you changed. 88 Responses to "How To Make A Reflux Still – Complete Plans To Build A Homemade Still"
Great information and tutorial very well explained and simple to understand. I like your delivery with information showing materials list and diagrams pictures and even a video, So lots of sources of information that gives people interested a correct perspective of how it all goes together and functions. I’m personally not new to reading stuff on moonshing but this is well written and dose cover everything in one place without hindrance and without confusing people with a million different ways to set up a still like most forums. Just a straight forward no nonsense webpage, Way to go buddy. Well done. Hey partner how you doing just wanted to make a comment saying I built the same exact still and I have had that thing crank out 193 proof and I tell you what that’s one of the best deals cheapest stills that you can get or make!!! if you want to spend five $600 even more you can buy one of those really fancy stills or you can make this one for fairly inexpensive,and I think it is one the best stills you can make !!! I don’t think you need all those trays and valves and fancy tubing that does next to nothing, this still is so simple and no joke this thing will put out 90-95% ethanol, my dodge runs great on it !!! Glad to here you liked the still plan! Upload some photo’s when your done building it. Haha thanks that was a mistake! I built one of these years ago. It distills well. After many batches I need to rebuild the kettlle. Leaky kettle is a very dangerous proposition. The column itself ? Okay as a reflux still not so great as a pot still. To do it over again I would not run the Liebig cooling pipes through the column. My second still uses a 2” 45 elbow to the Liebig condenser. So no pipes across the column. It works better unpacked as a “potstill” and better when packed as a reflux. The best improvement was adding a PID controlller to control the column temperature. With the price of copper nowadays I would not build another one. I can get a 2” column in stainless steel for less bother. Just uses copper mesh for packing and voila 92 to 94% ethanol. Hey, I’ve recently built a still but have not tested it yet the column it 15″ x 1″and the condenser is 7″ 1/2″ and was just wondering if that is enough to condense all the vapour and make high proof alcohol? It depends on the heat source your using for the still the more heat you put to the wash the larger your condenser needs to be. Test it out and see how it runs, if your condenser can’t keep up you may need to adjust the heat going to your wash. Hope that helps! I don’t know what size boiler you have but 7 inches long by 1/2 in is tiny. My condenser is made from a copper heat exchanger designed for an out door wood burning furnace. The main pipe is 1 &1/2″ diameter x 21″ long. Inside this main pipe it has 7 smaller copper tubes that get surrounded by cold water and the hot vapors condense inside these small tubes in a vertical assembly so the product just falls to the bottom to be collected. I purchased this heat exchanger for around $100 new and it has no problem with a 15 gallon boiler. For the water supply lines, I used water supply lines for a washing machine, then you can just screw the hoses on. Nice that’s a good idea! I’ve done the same before and it works great. The small copper tubes running through the column to the condenser is not enough surface aria to cause a good reflux, Maybe if you put some copper mesh inside the column directly in contact with the 2 cooling tubes it would increase the surface aria to get a better reflux action happening, it would be hard to get it in there and hard to keep it clean. I’ve had good luck with this design and found that the packing in the column to produce enough reflux for my needs. Did you build it ? Another option if your looking for greater reflux is to add a coil condenser around the outside of the column. Instead of using a copper coil inside the column I have a single copper tube loop with several copper plates soldered to it and a needle valve to control the coolant flow, I cut down the coolant flow just to the point that it allows some alcohol vapor to pass into the end condenser or what you would call equilibrium, It produces much higher proof from a single run. Hi there Thomas, that modification sounds interesting. I’m yet to build mine but this design looks good and simple enough for a half handy guy like me to build. I have to do it all in metric as I live in Sydney. Do you have an drawings or photos of your copper loop/plates ? where all is metric . 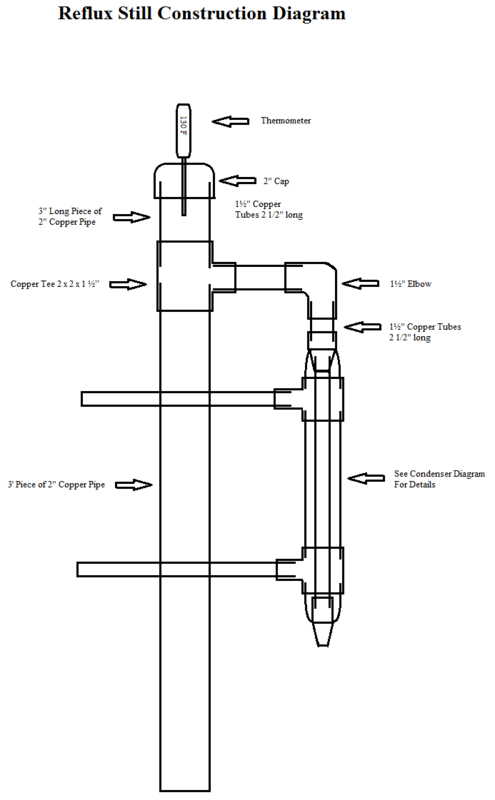 Where can I purchase the 2″ and 1 1.2″ copper pipe without buying an excessive amount? Great instructions Earl, I am a first timer and will give your design a go. My only concern is the packing material, Raschig Rings, is there a certain positioning of the rings that should be followed? Hi Mike Nope just pour them into the column. You can also use stainless steel scrubbing pads, marbles, broken safety glass from an automobile or glass beads. The idea is increase the surface area that vapors within the still can condense on. Using copper scrubbers or SS scrubbers works much better than rashing chips, marbles, glass beads or natural stones. The scrubbers have much more surface area for the vapors to condense on. I have a 15 gallon 304 SS beer keg with a 3 inch diameter x 3 foot tall copper column packed with both copper and SS scrubbers and at the top of the column I have 9 perforated copper plates cooled by a 1/4 inch copper pipe in a simple loop, The copper plates are spaced about 1/2 inch or so apart and the cooling water feed is separate from the condenser cooling water feed to give a better constant reflux temp. This is my dephlegmator of sorts. In the first run (after taking off one 8 oz cup for the heads) with a fresh corn and cane sugar mash I get around 2 & 1/2 gallons of 75% ABV very clean and crystal clear. I do a second run and I get 91 or 92 % ABV, It has a good sweet corn taste and smell. I have another 3 inch x 2 foot copper pipe to extend my column to 5 foot long but It makes the whole set up over 8 feet tall but my ceeling is not high enough to use it. At over 180 proof and cutting the heads and tails you only need one good shot to feel the heat and it produces no hang over sickness at all. How do you heat the mash? I posted several ways you can heat the wash in the plan. You probably missed it, you’re options are Stove Top Heat Source, Propane Boiler or Electrical Immersion Heaters each option was discussed in detail above. Hmmm thats not a mash ,,thats actually the wash..
Mash vs Wash – Mash is the term used to describe the point where grain and water are combined. Once you strain that grain off and ferment the liquid, you have wash. So you could call any beer or wine a wash assuming we were to distill it. Can you email me a picture of your still and plans if you have them. I am starting to build a still . Great still design easy to build and use,I made the easy rum recipe from this website and am very impressed with the finished product. I packed mine my column with copper pads for now seems to work well.Cant wait to run another batch. Could you recommend a good cleaning and sterilization process, after the completion of fabrication has been done? I woulke to make sure that the column and condenser is thoroughly clean before I pack it with mesh and begin production runs. You’ll defiantly want to remove any flux and lose pieces of solder from inside the column before you use it! To do this I’d recommend pouring pure vinegar into your boiler a Gallon or two should work attach your column and run the still for an hour or two. Remove the column and clean it with a long brush can get one at your local brew shop if you don’t have one already. Flush the column out with water after you’re done scrubbing and then add pure water to your boiler again and run it for another hour or so with a few gallons of water in the boiler this time. Scrub again with a brush and rinse. Now you should be good to go ! Anyone else got another suggestion ? If you’re going to use copper pads I wouldn’t push them past the water lines as you want to be able to remove them when cleaning your column. You could also use Raschig rings instead they will easily pass by the copper tubes inside the column. Both are fairly inexpensive. For the milk can what material are the one’s made of in your area ? I have a question. Does the two 1/2″ cooling tubes need to go through the column? Is it part of the distilling process or is it done to support the condenser. I was thinking it would be easier to pack scrubber pads into the column if the tubes were not in there. I would just hook the water to the condenser inlet without going through the column. Let me know what you think of this idea. The idea of the cooling tubes passing through the column serves two purposes. The cold water passing through the column will increase reflux within the column and add support to the condenser. But you can certainly do it as you mentioned as well. If you build the still and later decide you need to increase reflux you can always add a coil of 1/4 inch copper around the outside of the column add a needle valve to control flow. Not to bother you again, but how many liters of rasching rings do I need to order to fill the column to the required depth. What the best way to “sterilize” or “de-grease” stainless steel wool for the packing material? Boil it? Can I add a gin basket to this design, beneath the copper tee on the column? Send me some pics of your build so I can understand better @ learntomoonshine(at)gmail(dot)com Have you run the still yet ? Typically the longer the column the more reflex you will get inside it. But keep in mind as you increase diameter you need to increase the height to achieve the same purity. The 1/2 inch copper that carries water to and from the condenser pass through the column for two reasons. First I like it because it locks the main column and the condenser together with three paints of contact. I’ve seen the condenser bend from side to side if just attached from the top. Second the cold water passing through the column will add extra reflux a big plus if your trying to get a high proof product. Does that clear things up for you ? Great info I myself built the exact reflux Coloum and get 180 proof, I use real cooper wool on top of my coloum ,I put a thermometer so I can watch when it hits 173 degrees also a 15 gal SS beer keg with a thermometer also and watch for 212 degrees. To cool I use a cooler with ice water and pump with valve to control my flow of water. Frozen 1 gal jugs of water work great. I’ve always just use tap water for cooling the still as we’re on a well so don’t pay for water but I would imagine anyone in the city might want to try your method of recirculating water from a bucket or cooler. Got any pictures of your set up for folks to check out send em to me @ learntomoonshine@gmail.com and I’ll put em up. Or you can share them on our FB page If I get some time next month I’ll try to get a tutorial up on making this alternative cooling set up. I had to use a 4-1/2” piece of 1-1/2” between the elbow and condenser in order to reach the 2″ tee. Thought I had measured everything and even double checked. Will that affect anything? I was also going to put copper mesh/scrubber as a screen to hold the rasher rings from swimming in the keg, any down side to that? You should be all good. If your using copper mesh in the column make sure it’s actually pure copper and not made to look like copper scrubbers..
Is this large a enough reflux condenser, if I use a stainless 55 gal drum ? The 55 gal stainless drum, just happens to be easily available . The boiler size doesn’t matter much other then it’s gonna take a long time to heat that volume of liquid up with the heat sources listed in this plan. The important thing here is matching up the size of heat source with size of condenser so that the condenser can keep up! With that size I’d probably up size the heating source and condenser size! What were you thinking for heat source ? Internal element or propane stove ? I’m going to try the scrapyard for the pipe and fittings. just to see if they have them. I was able to purchase a 4’6″ piece of 2″ copper at the scrapyard for $25.00. That same piece of copper would have cost me $62.40 on e-bay. Awesome deal !! Ya the scrap yard is a great place to look for copper sheeting and or larger 2 inch column material as it’s $$$$ new. Hey Earl great site its exactly what i’ve been looking for clearly detailed plans on how to build one.I understand that this still is designed for spirits like vodka and gin but my interests are mostly whiskey can it still produce a decent whiskey?. I was thinking if i remove the column packing when making whiskey causing less reflux and allowing more impurities to go through it would have a more traditional pot still flavour.Would this be a good idea or not really (very new to distilling ).i love the simplicity of the milk container and thats why i want to build this one and not one made of coper sheet material. How do you add fruits and spices inline with this to produce flavored batches? Good question you would have to add a gin basket to the top of the still head. When I get some free time I’ll try to make up a plan for this. Has anyone already done this that could offer up some pictures to help Kyle out ? I don’t have any photos, but I have a 2″ column that I use a copper plate with holes/perforations in at the BOTTOM of the head. It’s a variation on something I saw with a bag of fruit/spices etc at the top. My still doesn’t come apart at the top so I use the plate at the bottom. I drilled 4 holes (2- directly across from each other 180 degrees apart and another 2 at the opposite 180 degrees about 1/4″ up on the bottom of the column. Basically, 1-hole at each “corner of the circle”. 12-3-6 & 9 on the face of a clock) I use 12 gauge copper wire from each hole, side to side to hold the plate in place. When running the still, the spirit evaporates and as super-heated steam, passes through the plate and fruit etc where it collects the steam from the fruit and is re-condensed on the other end as flavored spirit. I’m not sure how to post pics on here, but would be glad to do it if I knew how. Hey David thanks sharing you’re set up send me some pics at learntomoonshine(at)gmail(dot)com and I’ll upload them for everyone. I’m sure Kyle will be stoked to see your set up. I don’t think painting the column will greatly change the thermal conductivity, sure it will slightly reduce the heat transfer but probably not a noticeable change. That said I’ve never tested this myself I personally love the look of a copper column. Has anyone painted their still or seen it done ? I assume copper would be difficult to paint probably need an acid etch primer and a solid cleaning before you attempt it! Then there is also the question of possible contamination of the spirit from the paint ? I have built your still design at what temp should i run it at to get the best production?? For information regarding still head temperature when running your reflux still read this article… Still Temperature Guide For Making Moonshine. The vertical column allows steam rising to condense on the steel wool forming droplets which fall down through the wool, the ethanol in these droplets evaporate again. This process occurs several times until it reaches the head of the still where it will be almost pure ethanol. If you were to run the column horizontally the droplets would condense on the bottom of the copper pipe and run straight back into your still this would result in a very low reflux. You basically would be running a pot still at this point. What was the idea to change up the design ? I want to know why you ran the water inlet and outlet though the column instead of by itself? Is there a reason? There are two benefits to this.. First it’s a great way to fasten the condenser and column together and second it helps increase reflux withing the column.. I was wondering on how long a condenser would be needed if one were to use 1/2in dia. x .065 wall stainless steel tube and a cooling jacket of 1in. dia. I know that copper is a better hot/cold conductor but cleanup is my fret. also using .040in. diameter wall would make quicker heat exchange but it would make tig welding it very difficult. I’m thinking in the area of 30 inches, or would this be too long ? my other question , can it be too long ? The condenser can’t really be “too long” the advantage of making it longer is that it gives you more cooling capacity allowing you to boost the power going in to the boiler. 30 inch should work just fine. Send me a few pics of your still build (learntomoonshineatgmail.com) I’ll post them on our FB page and here ! Not quite the same, but have you ever built a recycling still for plant oil extraction? You mentioned the pot has to be stainless steel. Why stainless? Is it for longevity of the boiler? Thanks for your time. You can pack the column to the bottom. Have you ever put this column on a copper boiler? Using copper pads you would pack from the bottom to where in referance to the cooling tubes the bottom tube or top tube? Do the pipes carrying the cooling water to the condenser have to go through the reflux column? Or are they there just to stiffen the whole assembly? They stiffen the assembly and carry cooling water to the condenser. The nice thing about this design is that the pipes passing through the column increase reflux within the column.